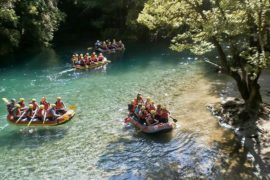 A holiday in Romania means many things: culture, history, spirituality, medieval, nature, particularity, legend, adventure, slow food, fun… Come and see, taste, hear, and discover this unique country! 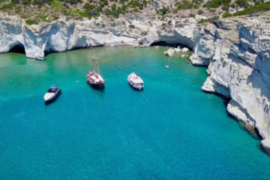 This tour operates with a minimum of 4 and a maximum of 10 travelers. Other group rates available on request. Arrive in Bucharest, the nation’s center of cultural and economic life, formerly known as “Little Paris.” Our English-speaking guide will meet you, and he will assist you during your stay. 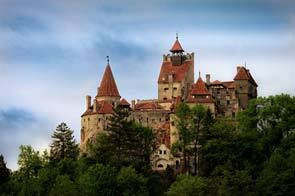 Your first destination will be Sinaia, the Pearl of the Carpathians. Your welcome dinner will be a special one, with wine and champagne tasting at the Rhein Cellars in Azuga. You will spend your first night at the 4* New Montana Hotel in Sinaia. 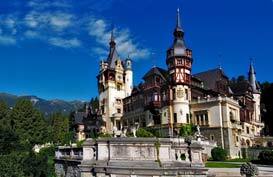 After your breakfast we will visit an architectural jewel, Peles Castle, one of the best-preserved royal palaces in Europe. 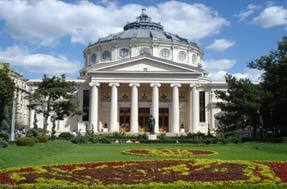 It served as the summer residence and final resting place for several Romanian monarchs, including King Carol I. 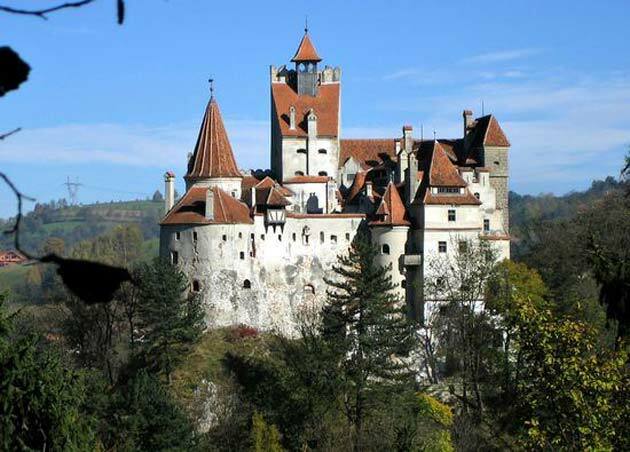 On the way to Brasov, we’ll tour Bran Castle, commonly known as Dracula’s Castle, which served as inspiration for Bram Stoker’s novel Dracula. After such an inspirational morning, lunch will be served in a traditional restaurant in Bran. In the afternoon you will drive to Brasov, a medieval city known as the “The Crown City,” one of the most secure fortresses in Europe. During our Brasov tour we will visit the magnificent Black Church, the largest gothic style church between Vienna and Istanbul, and we’ll stroll around the old Council Square, lined with beautiful red-roofed merchant houses. 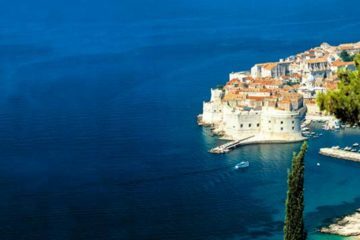 You will be able to admire the Black and White Towers, the Ekaterina’s Gate, the Schei Gate, and Rope Street, the narrowest street in Europe. To end the day in a joyful spirit, your dinner will be served in a medieval citadel with a philharmonic concert and opera singers. Overnight at 4* Sport & Spa 4* Hotel in Poiana Brasov. 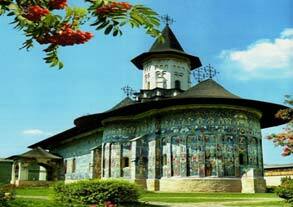 Early in the morning we leave for Agapia Monastery, the wood church from the 14th century, painted inside by the greatest Romanian painter, Nicolae Grigorescu. Within the confines of the Agapia Monastery walls live over 500 nuns who work in the fields, tend vegetable gardens and weave carpets and embroideries for tourists. The monastery is well known thanks to its carpet and embroidery workshops. Next we will visit Neamt Monastery, the oldest monastery in Moldavia, with its old library. After a long tour your lunch will be served at Neamt Monastery, offered by the monks. In the afternoon we will arrive in Bukovina, a region called “The Land of 2000 Monasteries.” The monasteries, with their inside and outside frescoes, each with its own dominant color, were painted between the 15th and 16th centuries and are considered masterpieces of Byzantine art – unique in Europe, that’s why they are part of UNESCO heritage. The first monastery we will visit is Voronet. 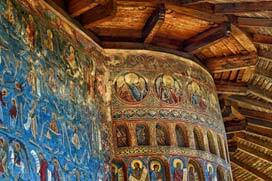 It was founded in 1488 by King Stephen the Great and known as “The Sistine Chapel of the East,” due to its famous dominant color, “the blue of Voronet.” Your dinner will be a traditional homemade one, and the night will be spent at the 4* Popas Bucovina Hotel in Sucevita. After breakfast we will tour the next monasteries, Moldovita and Sucevita, both richly-decorated houses of worship. Moldovita Monastery, built in 1532 by Petru Rares, is painted both inside and outside with scenes such as the “Victory of Constantinople,” “The Prayer of the Holy Virgin,” and “Tree of Jesse.” The dominant color of the Monastery of Moldovita is sunny yellow. 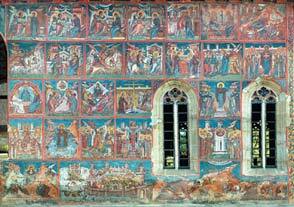 This is the largest church built during the period of Moldavian style. Sucevita Fortified Monastery was the last building in the style of Stefan cel Mare, exterior frescoes date from 1596, and the color green predominates all over. Lunch at Casa Venera in Sucevita. Dinner at the 4* Popas Bucovina Hotel in Sucevita, where you will also spend the night. 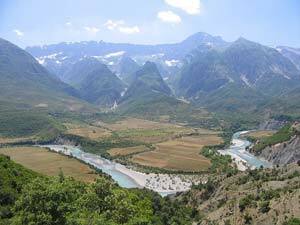 In the morning we’ll head to Transylvania, “the land beyond the forests.” We will now enter the real realm of Dracula, the Tihuta Pass that connects Transylvania to Moldavia. 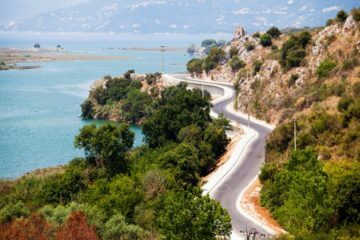 This wild and mysterious place was used for the setting of the movie “Dracula” by Coppola. We’ll continue with Targu Mures, a Romanian/Hungarian cultural city. The center is dominated by the Roses Square, the Palace of Culture, the Prefecture, the City Hall, and many other buildings in Art Nouveau style. To continue learning about the locals and their traditions, we will have lunch at a traditional restaurant in Targu Mures. 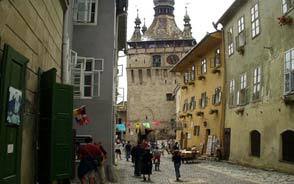 In the afternoon we’ll get to Sighisoara, “the fortified citadel,” also a UNESCO heritage site. You will be able to enjoy its medieval atmosphere, its corners and narrow streets full with antiquaries and souvenirs. Visit the historical center of the city surrounded by towers and walls, among which stands the Clock Tower. We will walk up the stairs that lead to the oldest school, which has a panoramic view. To remain in the same atmosphere, your dinner will be served in the house where Count Vlad was born, now turned into a medieval restaurant. You’ll spend the night at the 4* Korona Hotel in Sighisoara. In the morning we will drive to Biertan (UNESCO) to visit some of the 300 fortified churches built between the 14th and 16th centuries. The Citadel of Biertan, built high on a hillock right in the center of the village, is surrounded by two and a half walls connected by a covered stairway. It was defended by triple walls, 6 towers, and 3 bastions. The door of the vestry, built in 1515, is remarkable for its blocking system. 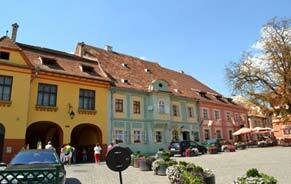 We will also drive to Sibiu, the European Capital of Culture in 2007. During the city tour we will pass through the old streets and admire the main monuments, such as the Bruckenthal Palace, built in Baroque style in the late 18th century; the Lies Bridge, built over a road that connects the upper city with the lower city; the Saxon Cathedral, erected at the beginning of the 16th century; the Catholic Cathedral, built in German Baroque style; the beautiful squares of the city; and the Christian Orthodox Cathedral, headquarter of the Metropolis from Transylvania. Lunch at a centrally-located restaurant. We will continue our journey to Ramnicu Valcea. 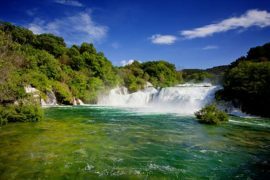 The area has been inhabited since Dacian and Roman times and was the site of a castrum. A new fortress was built on the location during the Middle Ages, and it was here where the first paper mill and printing press in Romania were built. Dinner and accommodation at the 4* Grand Hotel Simfonia in Ramnicu Valcea. In the morning, after your breakfast, we’ll head to Bucharest via Pitesti. 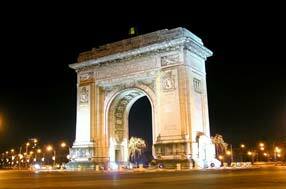 Founded over 500 years ago on the banks of the Dambovita River by the ruler Vlad Tepes, Bucharest later became the capital of the principality, and eventually a great European metropolis. 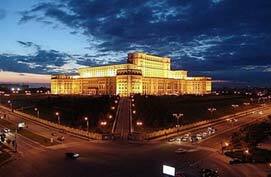 The communist period left an indelible mark on the face of the capital, but after a period of modernization, today it is a sparkling city with night clubs, cafes, restaurants, art museums, parks, and gardens. We’ll take you in a panoramic city tour of Bucharest including: The Parliament Palace (that you will also visit inside); the Revolution Square, with its beautiful Atheneum and the Royal Palace; Avenue Kiseleff, with its Arc de Triomphe, similar to the one in Paris; and Victoria Avenue, full with casinos, luxury shops, and buildings in French style. After such a busy afternoon, your lunch will be served at a restaurant by the airport, and we will transfer you to Otopeni International Airport for your flight home.